Christmas has come and gone and I have “Let it Go” from Frozen permanently stuck in my head. Owen received Frozen on Monday, and he has been obsessed ever since. He keeps following us around saying, “more go”. He was mad tonight because we wouldn’t let him watch it because he didn’t eat much for dinner and threw a tantrum. We’ll have to wait and see how tomorrow goes. We spent Christmas with family and friends in Pittsburgh. Our days were full of eating (so much eating), drinking, and opening gifts. Owen got so many gifts that we still haven’t opened them all. I need to go through his current toys and see if I can swap some out. Same goes for his books. Owen was lucky enough to get his very own drum set :/. It actually isn’t that loud, and he really likes it. The problem is that we don’t have any room to have it out all the time. Its current home is in Tony’s office, which kind of defeats the purpose of having an office. I now have a helper in the kitchen. He isn’t tall enough to reach the counters, but he can reach his own play kitchen. My little helper, Owen, really likes “cooking” and “washing his hands” in his sink. He received a play kitchen for Christmas, and we were able to squeeze it into the kitchen. This year, as in past years, Tony played Santa at my parent’s house for the kids. This is always great for a good laugh from the adults and crying from the kids. Owen stared at Santa the whole time even after he got his gift, but then when he got closer for a picture the tears started flowing. I think next year he might be more curious about Santa. Good morning, Owen. Mommy loves waking up at 6am on a Sunday after a Holiday party :/. I’m not sure why he woke up so early this morning. My only guess is that he is getting more teeth because he has been drooling like crazy. After he was fed I decided that it was a good idea to watch The Christmas Story. It was nice to get some morning cuddles, but why so early? Maybe he is getting back at us for making him go see Santa on Friday? He was doing so well waiting for Santa until we sat him down on Santa’s lap. Owen immediately started screaming and squirming – as if being near Santa was burning him. It was awful. I wonder how he is going to react to Tony dressing up as Santa? We’ll just have to wait and see. We’ve been clicking away buying all of our Christmas gifts online, and now we have so many boxes that our recycling bin is full. We’ll have to make a special trip to the recycling center to dispose of the rest of them. It’s probably not acceptable to give everyone their gifts in the Amazon box so we should probably start wrapping soon. While we were browsing for gifts online we decided to start a new tradition with a Christmas calendar. 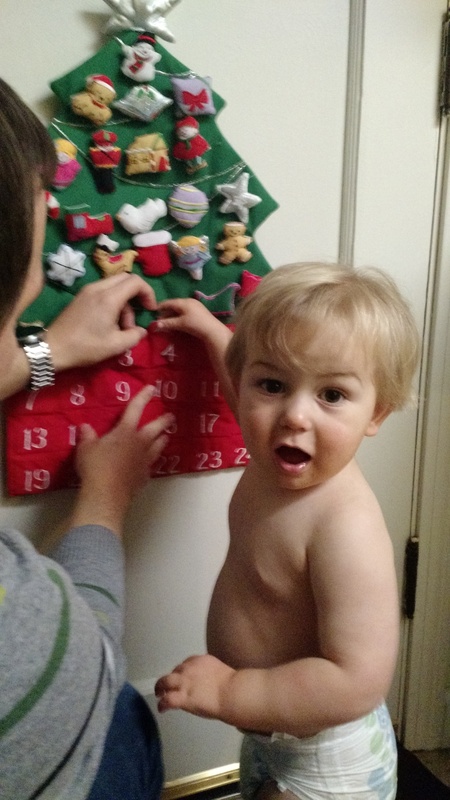 I know it was a little late in the month to start the calendar, but Owen likes doing it every morning. The hard part for him is to only pick one thing to put in the pocket. 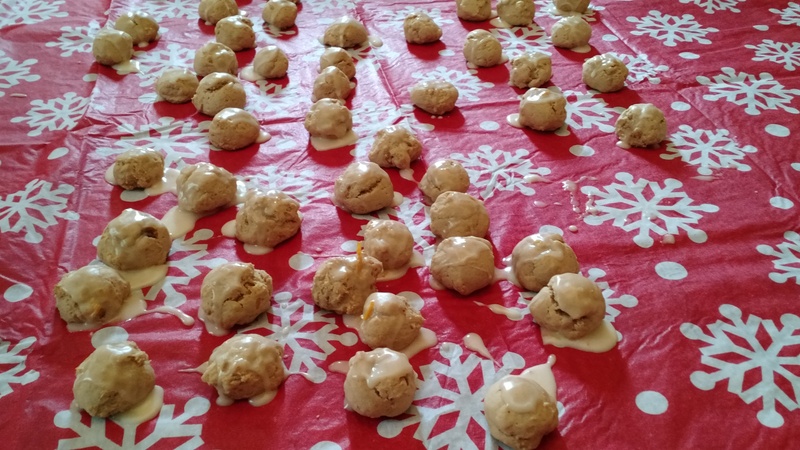 Last weekend I made my grandma’s orange cookies for the first time. I’ve been meaning to make them for over a year now and I finally did it. Luckily Owen took a nice long nap so I could bake away. The whole process took about 3 hours from start to finish. After the cookies cooled for a bit they tasted pretty good. Maybe they will taste even better next year. You know it’s the Christmas season when your inbox is filled with Amazon confirmations. It’s so nice to not be out with the crowds shopping. This past week we pulled out all of the Christmas decorations. We knew it would be more challenging this year with a toddler. It took a few days to get everything out and looking good. I really thought that we would need a fence around the tree, but he seems to be staying away for the most part. He also now knows what a tree is and keeps pointing at them (inside and out) and saying “treeeee”. So after decorating for 3 days (had to let the tree branches fall) our house feels even more cozy inside and out. It is so much fun hearing all of the new words and sentences that Owen has been chatting up these past few days. I couldn’t believe when he started to put a few words together! Way to go Owen! Daycare is really paying off :). I guess the reading helps out too, though it is a little bad that I have Dr.Seuss quotes going through my head while at work. We did it! We made it all the way to VA for Thanksgiving with Owen in tow. I think what made the trip more bearable was the tablet. When all else failed I gave him our tablet that had some movies and shows saved on it. I was able to push it under the headrest so it was out of reach. The few minutes of silence was fantastic. I know screen time for children under 2 is bad, but he enjoyed it and everyone was in a better mood once we arrived. I also put together a few busy bags to help keep him occupied in the car and restaurants. 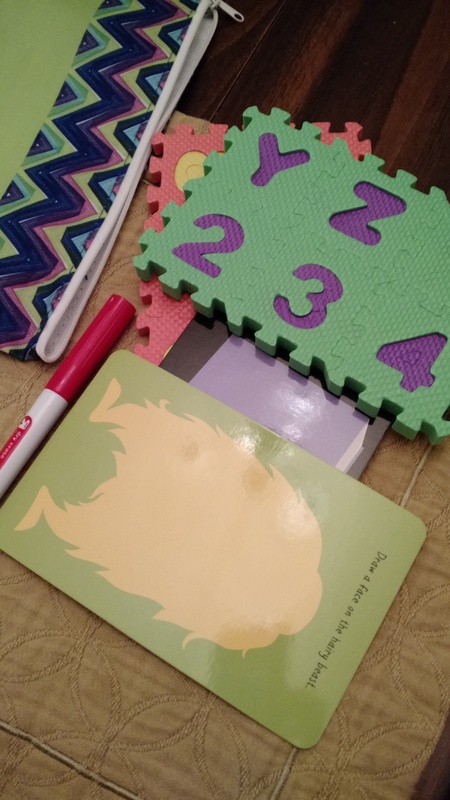 One bag had a dry erase board and small letter foam puzzles. Another one had small coloring books, and a third had a notebook and stickers. I found all of this stuff at the dollar store. 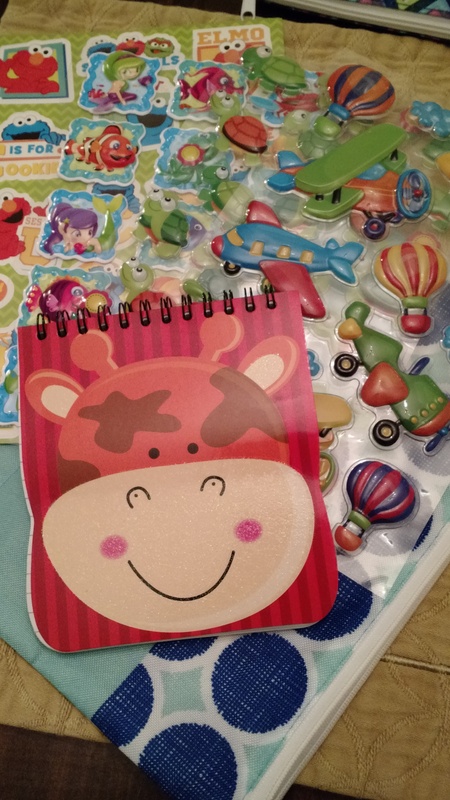 He really enjoyed peeling the stickers off and putting them in the notebook. I found this idea from the YouTube channel the Purple Alphabet. They always have great ideas to keep your kids busy. 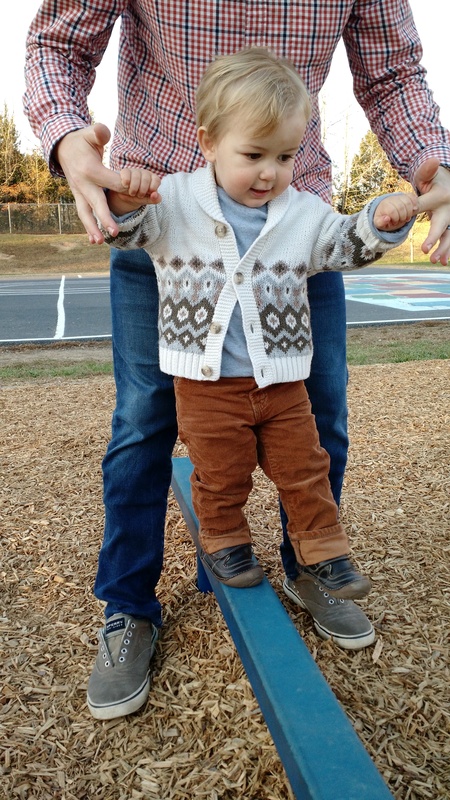 Weather has been mild here in OH, but it was even warmer in VA, and we took full advantage by checking out some playgrounds in the area. One thing that I’ve never seen before were bucket seat swings. I’ve seen the traditional plastic ones that little kids can put their legs into, but this was the first time that I’ve seen reclined bucket seats. 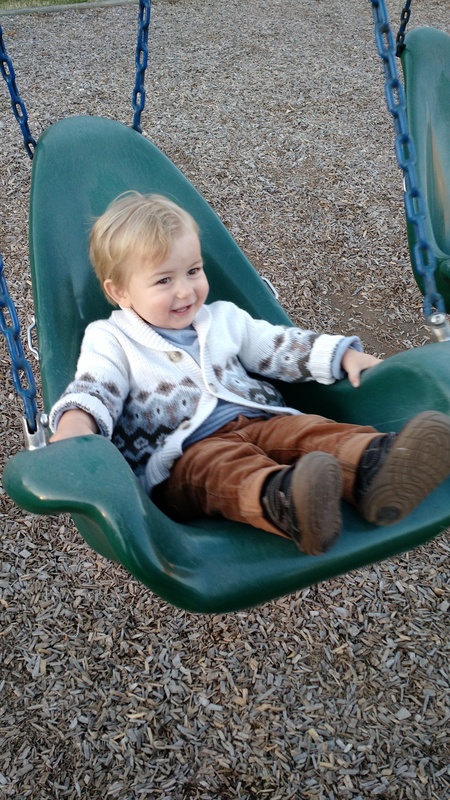 Owen really enjoyed being outside and swinging in the seats. He loved them so much that he didn’t want to play with anything else, and he threw a tantrum when we tried to take him off of the swing. We celebrated Thanksgiving at my sister-in-law and her boyfriend’s house. 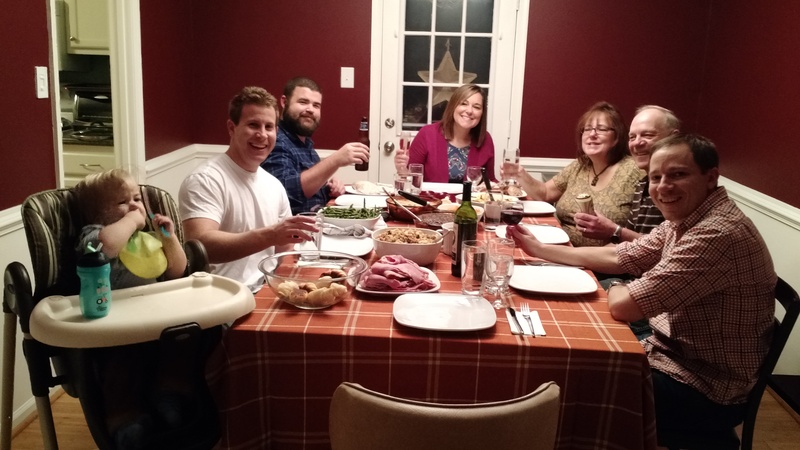 It was very nice to spend some time with them and especially to only have to bring the cranberry sauce and wine. Thank you so much for making all the food, Lisa. It was delicious! I wish we lived closer and could have taken some leftovers.